Decaffeinated coffee is great if you fancy a coffee in the evening but don’t want that crazy caffeine rush. It also allows those of us to enjoy a coffee who wouldn’t usually drink coffee due to the caffeine level. But what actually goes into decaffeinating coffee? Here at Two Chimps Coffee, we purchase decaffeinated coffee which has been through one of two different processes; Swiss Water and Sparkling Water. There are also a number of solvent-based methods that exist when decaffeinating coffee. Let’s look into the differences below. The Swiss Water Process was introduced by ‘Coffex’ in 1979. At the time, this was the only commercial decaffeination method that didn’t involve the use of solvents. To start, the beans are soaked in a caffeine-free green coffee extract. This extract attracts the caffeine from within the coffee bean, allowing everything else to remain in the beans. The green coffee extract, which is now full of caffeine, is processed through activated charcoal to remove the caffeine. This allows the extract to be ready for the next batch of beans. Once the caffeine has been mostly removed, the beans are dried until they reach the original moisture level and then re-bagged. This method was discovered by scientist Kurt Zosel at the Max Planck Institue for Coal Research in 1967. Using this method, the beans enter a ‘pre-treatment’ vessel where they are cleaned and moistened with water. When the beans absorb the water, they expand, allowing their pores to be opened. This also allows the caffeine molecules inside the coffee bean room to move. After the water is added, the beans are mixed with liquid carbon dioxide. This combines with the water to produce sparkling water. The carbon dioxide moves through the beans and draws out the mobile caffeine molecules. Once used, the sparkling water will enter an evaporator to remove the caffeine-rich carbon dioxide from the water. The caffeine-free water is then pumped back into the vessel for the next cycle. This cycle is repeated until the required amount of caffeine is removed. They then stop the circulation of carbon dioxide, and the green beans are discharged into a drier. The decaffeinated coffee is then dried until it reaches its original moisture content. Solvent-based processes involve a chemical solution to remove caffeine from the coffee bean. The solutions often used are either methylene chloride or ethyl acetate. Two different solvent-based processes are used in decaffeinating coffee. The first is the ‘indirect-solvent process’. To start, the beans are soaked in almost boiling water for several hours. This begins to extract the caffeine from the coffee, but it can also remove some of the oil and flavour from the beans. Next, the beans are moved to another tank where they are washed again; either in methylene chloride, or ethyl acetate, for around ten hours. The solvent chosen, bonds with the caffeine molecules and is heated to evaporate the solvent and caffeine. The beans are then brought back into the original water mixture where they can reabsorb some of the oils and flavours that may have previously been lost. The second process is the ‘direct-solvent process’. Firstly, the beans are steamed, allowing the pores in the bean to open. This makes them more receptive to the solvent which follows. Once the steaming process is complete, the beans are rinsed repeatedly with methylene chloride or ethyl acetate. 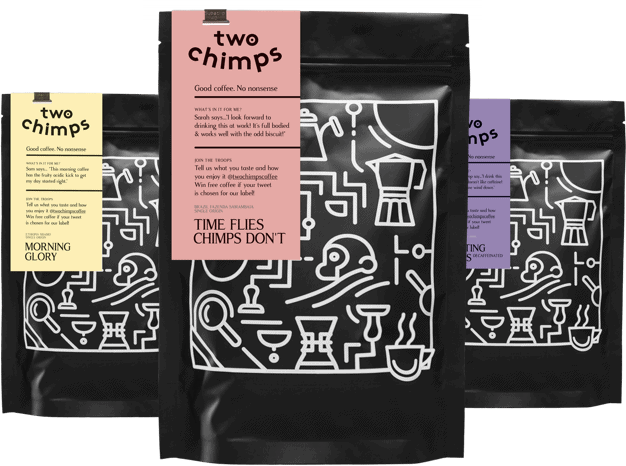 As said previously, here at Two Chimps Coffee we only ever roast decaffeinated coffee that has been treated using the Swiss Water Process or the Sparkling Water Method. Now you know the processes behind decaffeinating coffee, you can enjoy your coffee, safe with the knowledge that it is chemical free. Sounds super? Our decaffeinated coffee is available to buy from our shop. Need a steady flow of decaffeinated coffee? We offer a coffee subscription too. Want to try our decaffeinated coffee for yourself? Head over to our shop where you will find our decaffeinated coffee along with our other coffees too.